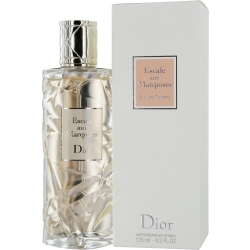 Introduced in 2010, Escale Aux Marquises is one of many women's perfumes in the Christian Dior line. This feminine scent was created by Francois Demachy, and it is perfect for day or evening wear. Its orange and lemon notes provide a hint of citrus, which is combined with the spicy scents of cinnamon, nutmeg, ginger, and coriander. You'll draw lots of attention wearing this enticing, long-lasting fragrance; just a couple of sprays and head out the door.